For patients diagnosed with a small (i.e., < 4 cm) kidney tumor (Figure 1), laparoscopic and robotic partial nephrectomy provides patients with a safe and minimally invasive technique for removal of the tumor, while preserving the remainder of the healthy kidney. 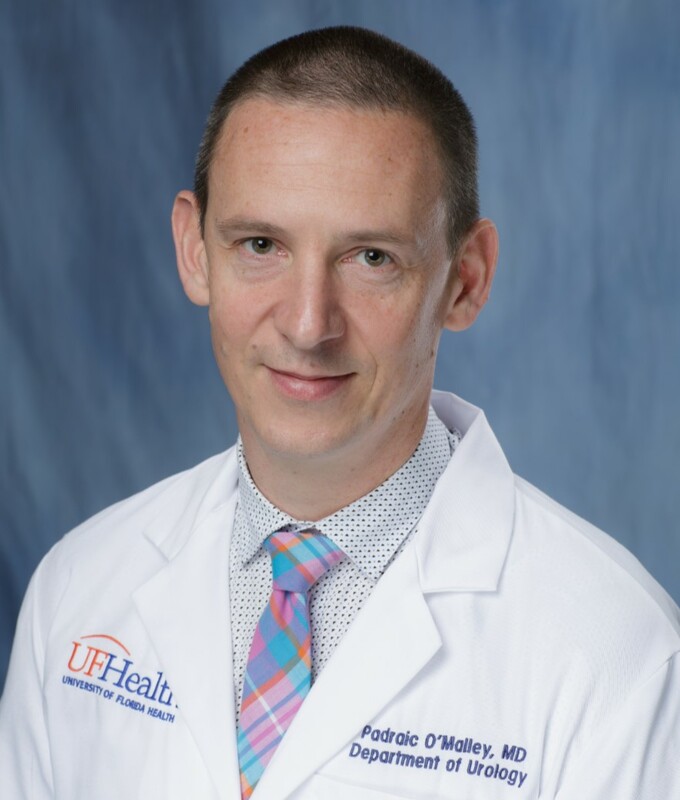 By removing only the tumor and not the entire kidney, patients have a significantly lower risk of kidney failure down the road. These minimally invasive approaches have the advantage of improved cosmesis, reduced pain, blood loss, and hospital stay, as compared to conventional open surgery with similar cure rates. In select patients with larger tumors, partial nephrectomy may not be feasible and therefore radical (i.e. complete) nephrectomy may be required. To learn more about kidney (or renal cell) cancer, please click here. 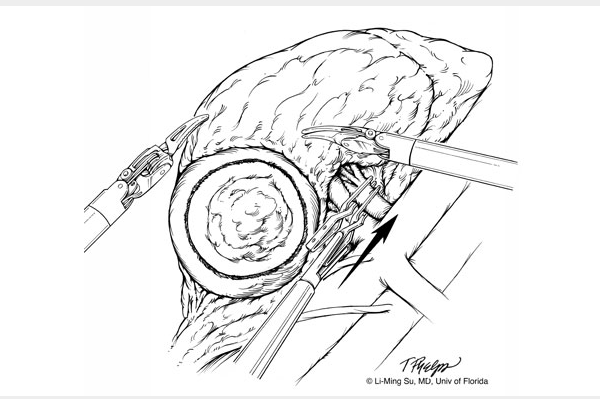 Laparoscopic and robotic partial nephrectomy requires that patients undergo a general anesthesia. While operative time varies from one individual to another, the average operating time is approximately 3-4 hours. 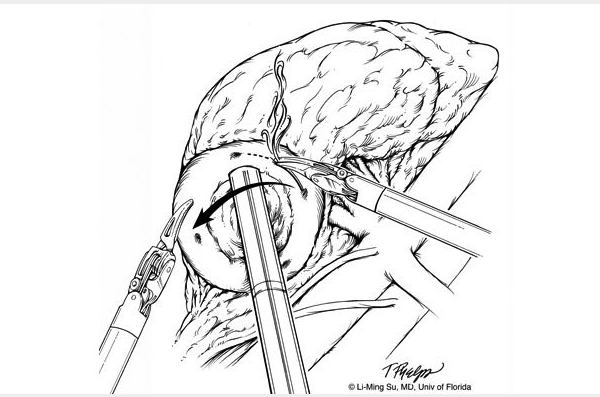 During laparoscopic partial nephrectomy, approximately 3 to 5 small keyhole (< 1cm) incisions are made in the abdomen (Figure 2), which allow the surgeon to insert a telescope (called laparoscope) and hand-held surgical instruments into the abdomen through portals called trocars. Figure 2. 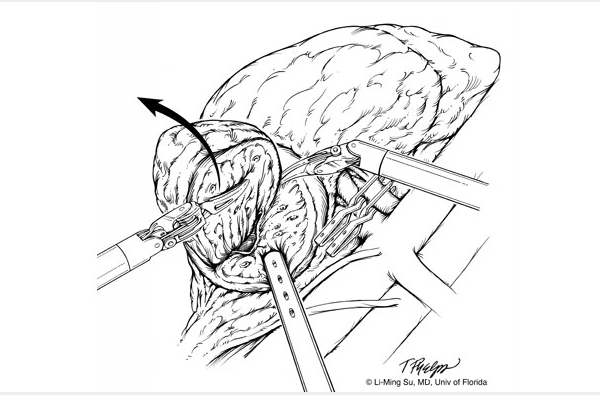 Trocar configuration for laparoscopic and robotic partial nephrectomy (courtesy of Intuitive Surgical Inc, Sunnyvale, CA). Figure 4. 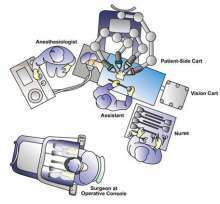 Operating room configuration for left robotic partial nephrectomy (courtesy of Intuitive Surgical Inc, Sunnyvale, CA). In addition, the surgeon controls a stereoscopic lens which provides a three-dimensional, high definition image of the anatomy. The affected kidney is then dissected and exposed. 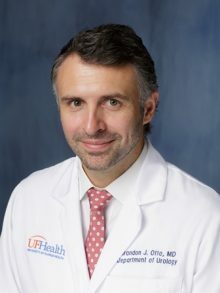 The tumor is then located and visualized in real time within the kidney with the use of a laparoscopic ultrasound probe. This ultrasound allows for precise delineation of the borders of the tumor within the kidney and for planning the proper line of excision in order to remove the mass completely. The blood supply to the kidney is temporarily clamped to minimize blood loss during excision of the tumor. The tumor, surrounding fat and a rim of healthy kidney is excised along with any visible surrounding lymph nodes. Once the tumor is excised from the kidney, it is immediately placed within a plastic sack which is later removed intact at the end of the operation through an extension of one of the existing abdominal incision sites. The kidney defect is then closed with sutures and surgical glue and the blood supply to the kidney is restored. 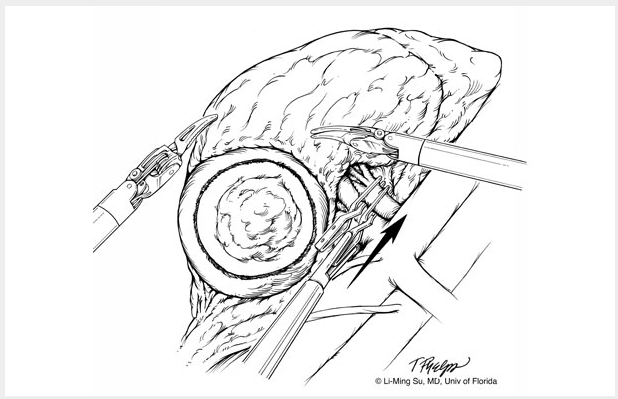 A small drain is left at the end of the procedure, exiting one of the keyhole incisions. Finally, the mass is removed from the abdomen through the plastic entrapment sack and the skin incisions are closed using plastic surgery techniques to minimize scarring. Urine Leak: When performing partial nephrectomy for large or deep seated tumors, the collecting system that drains the kidney of urine may be entered during surgical excision of the mass. Although the defect in the collecting system is closed with sutures, small leakage of urine from this site into the surrounding area of the kidney may occur. 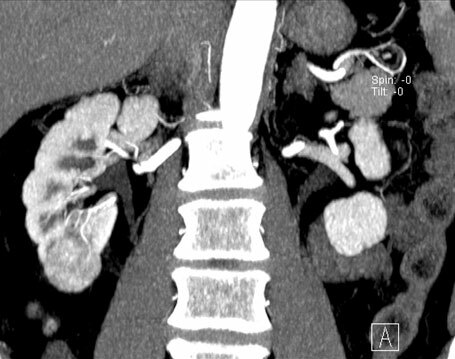 In the rare event of a large urine leak, a ureteral stent and/or urethral catheter may be required to allow for spontaneous resolution of the leak. Complete Removal of Kidney: In very rare cases, circumstances may arise that lead your surgeon to remove the entire kidney. These circumstances include excessive bleeding or a tumor that appears larger or more invasive than was appreciated on preoperative imaging tests. In such cases, the kidney can generally be removed safely by laparoscopy and often does not require conversion to open surgery. Conversion to Open Surgery: In the rare event of complications or due to difficulty in dissecting by means of laparoscopy or robotic surgery, conversion to open surgery is sometimes required. This could result in a larger standard open incision and possibly a longer recuperation period. Postoperative Pain: Although most patients in the first few days after surgery experience mild pain at their incision sites, this is generally well controlled by use of intravenous pain medication, a patient-controlled anesthesia pump, or oral pain medication provided by your nurse. You may experience some minor transient shoulder pain (1-2 days) related to the carbon dioxide gas used to inflate your abdomen during the laparoscopic or robotic surgery. 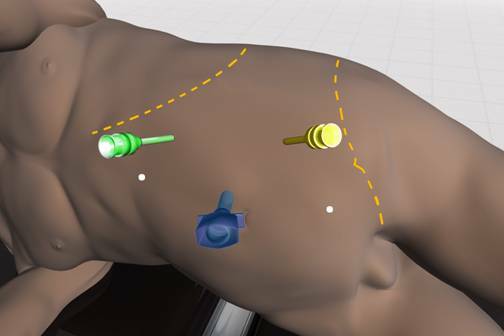 Flank Drain: A small clear tube or drain will be placed during surgery exiting out of the side of your flank. The drain output will appear blood-tinged but should be minimal. The drain primarily serves to identify any excessive bleeding or a urine leak from the partial nephrectomy site. The drain is typically removed on the day you are discharged from the hospital if the output remains low. Hospital Stay: The length of hospital stay following laparoscopic and robotic partial nephrectomy is generally 1-2 days. Activity: Walking 6 times a day for the first two weeks after surgery on a level surface is strongly encouraged as prolong sitting or lying can increase your risk of pneumonia and deep vein thrombosis. It is permissible to climb stairs. No heavy lifting or exertion for up to 4 weeks following surgery. Patients may begin driving once they are off of narcotic pain medication and have full range of motion at their waist. Most patients can return to full activity including work on an average 3-4 weeks after surgery. Follow-up Appointment: Patients are routinely scheduled for their first postoperative appointment in the urology clinic approximately one month following surgery. To confirm your appointment time and date you can call the UF & Shands Medical Plaza Urology Clinic at 352.265.8240. Pathology Results: The pathology results from your surgery are usually available in approximately one week following surgery. 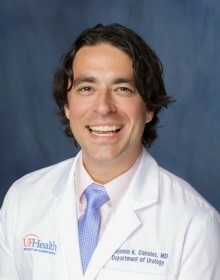 Contact UF & Shands Medical Plaza Urology Clinic at 352.265.8240 to obtain your results by phone. You are also welcome to request a copy of your pathology report through the Medical Records Department at 352.265.0131. What is the advantage of laparoscopic and robotic partial nephrectomy as compared to open surgery? 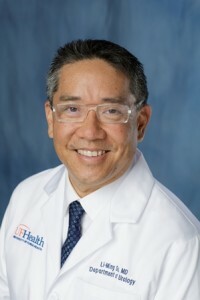 These minimally invasive laparoscopic techniques have been routinely performed since 1992 and have translated into a significant benefit to patients including reduced blood loss and transfusions, reduced pain, shorter hospital stays, improved cosmesis, and a faster recovery as compared to open surgery. 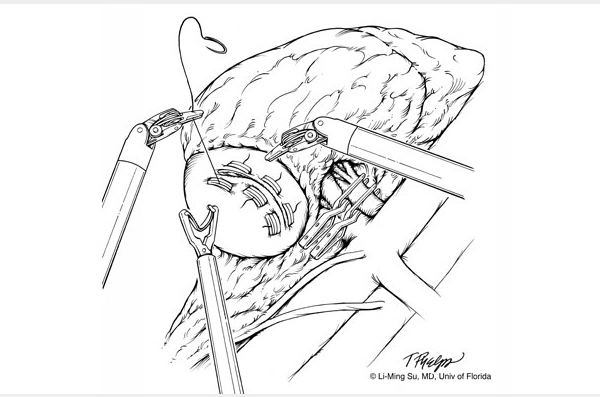 While open surgery requires either a large abdominal or flank incision, minimally invasive approaches involve 3-5 keyhole incisions in the abdomen. 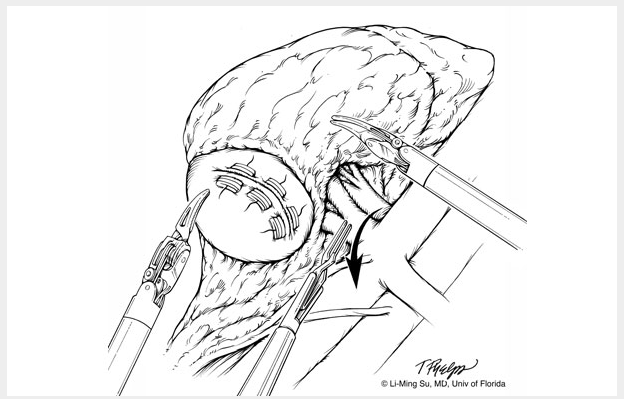 Published outcomes of laparoscopic and robotic partial nephrectomy demonstrate comparable cure rates to open partial nephrectomy. 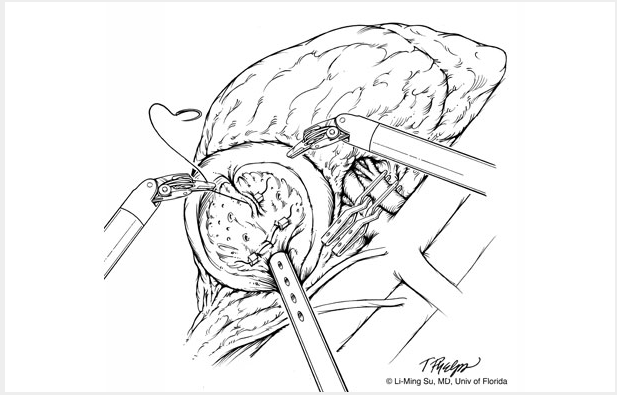 Most patients with kidney tumors who are candidates for open surgery are also excellent candidates for a laparoscopic or robotic approach. 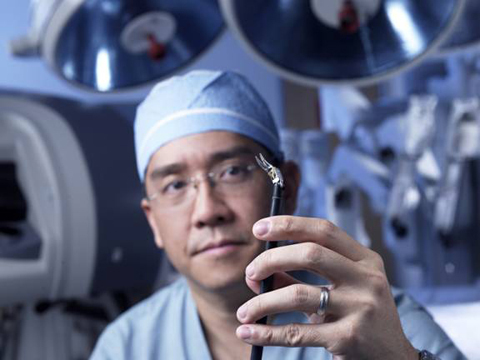 These minimally invasive approaches have become the standard of care for most kidney tumors. 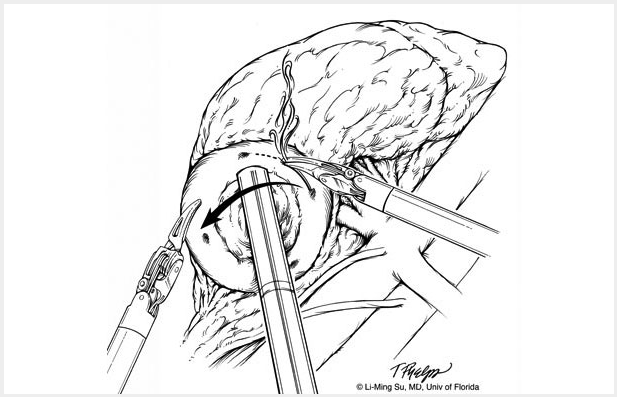 In general, there are no particular disadvantages; however, some situations may dictate the need for open surgery (see below). 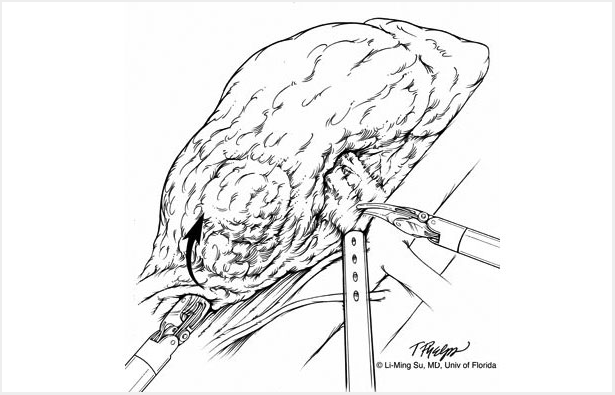 What patients are not good candidates for laparoscopic and robotic partial nephrectomy? 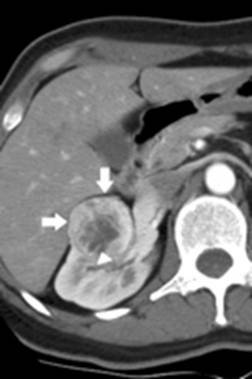 Patients with very large tumors or tumors invading surrounding structures (e.g. vena cava, liver, or bowel) may be best served by an open approach due to the extent and need for adjacent organ resection. Medical conditions such as severe lung and heart disease may not be able to tolerate a laparoscopic or robotic approach. Both are laparoscopic approaches and the choice of approach is a matter of surgeon preference. Operative times, blood loss, and hospital stays are similar between a pure laparoscopic and robotic technique. These procedures are performed by inflating the abdomen with carbon dioxide gas and placing a laparoscopic lens affixed to a high definition camera into the abdomen to view the internal organs. Conventional laparoscopic surgery involves hand-held instruments, while robotic surgery involves the use of a sophisticated robotic device (called the da Vinci S Surgical Robotic System) with wristed instrumentation to allow the surgeon to dissect within the abdomen while controlling these instruments externally from a surgeon console. What is the overall success rate of laparoscopic and robotic partial nephrectomy? 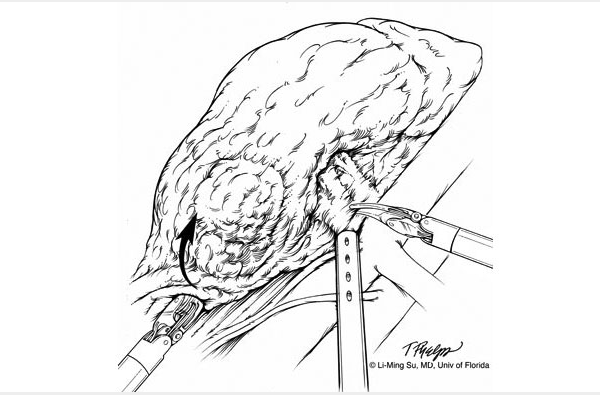 Success rate in complete removal of the kidney tumor is similar to open surgical approaches. Prognosis of cancer-free survival is based upon the grade, stage and particular type of your cancer and will be discussed with you by your surgeon following surgery during review of the pathology report. 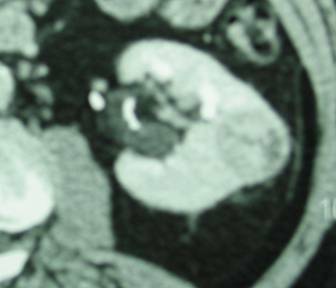 For patients with small, incidentally detected tumors on CT or MRI, prognosis remains excellent as most are cured with surgery alone. 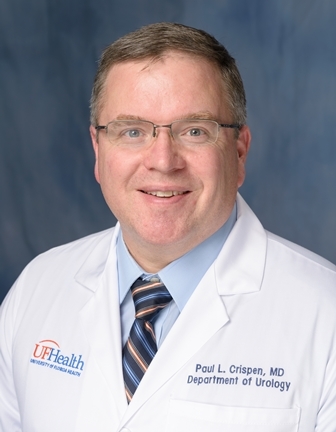 Rarely, patients are found to have large, invasive cancers that may require adjuvant treatment with medical therapies such as interleukin-2, interferon-alpha, or tyrosine kinase inhibitors. These would be administrated under advisement of a medical oncologist. Currently there is no utility for radiation or chemotherapy.